The Venerable Chung Zern of Chen Yen Szu, Taiwan. Back to Taiwan, how many days was that ago! A small group of us went to this temple towards the end of my stay in Taiwan. There was a bit of a problem as we approached the temple. I’d quite forgotten to take off my slippers when leaving the city temple and a solution had to be found which involved me in switching shoes with the lay woman with us. The car load could not be convinced that the same problem then existed for the lay woman, i.e. the wrong shoes. This was rather a brief visit. We looked round the new temple which had been completed about two years ago. It was really very nice looking however, it was explained to us, not very practical in design. One example of this was a big water feature running through the temple buildings which they could not use. Problem being that frogs had started to breed and kept everybody awake at night. Also there was fears of killing the frogs during cleaning…so they have a permanently dry water feature! We had lunch with the disciples of the Abbess in the kitchen and the rest of the visiting nuns and lay devotees had theirs in a large room off the kitchen. It was all open to the outdoors and very very hot. As we talked about the temple and the multiple problems they had with its design, building and maintenance it emerged that they actually all still lived in the old temple. They preferred it over the new one as it was more comfortable and familiar to them. I was really touched by this small band of nuns training together up a mountain. They were very pressing in wanting me to stay longer or to come back to stay longer in the future. I must confess I did entertain the idea for a few moments however it is unlikely I’d be able to do that. What a beautiful setting and, as it happened, just across the valley from the mountain temple of my host for the weeks stay in Taiwan. In this mountain area of Taiwan there are many temples small and large, the area is called Puli. Rev. 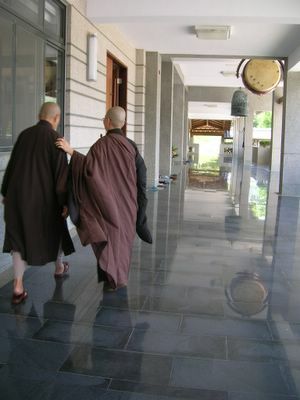 Chung Zern with her disciple walk in the new temple. Rev. Chung Zern is a disciple of Rev. Kim Seng and my Dharma Aunt. She is one of only three female disciples of Rev. Kim Seng. The other three being Rev. Master Jiyu-Kennett (the first one) and Rev. Seck Lee Seng of Cheng Hoon Teng, Melaka.